Why chose Chennai for dental treatment? Chennai, the cultural capital of India, stands third among the most visited place in India. This metropolis is the capital city of the state Tamil Nadu. The deep-rooted tradition and cultural heritage of the country are truly reflected in this city. Every new kind of development is welcomed warmly by this growing city. Chennai is emerging as a preferred location for dental tourism. Chennai houses some of the best dental hospitals and treatment centres with the world-class facilities. The international standards at met at every step along with quality based expert service. Every clinic is specialized with modern technologies and stringent sterilization practices. Treatment at affordable cost is another important aspect which attracts people from different parts of the world. Chennai provides its visitors with latest dental treatments and services at an affordable range. Apart from best quality and cost-effective dental treament, the city offers a a wide variety of tourist destinations. The beauty and serenity of Chennai is a must to enjoy. Numerous colonial monuments, beaches, carved temples, parks and many more, adds charm to this place. Several art galleries and cultural centers such as Kalakshetra, Valluvar Kottam, etc depict the traditional values of the city. A shopping paradise for every budget is provided here. A plenty of mouth-watering food is the speciality of this place. The place is well-furnished with luxury hotels like Poonis Grand Inn, Le Chennai Palace, Lemon Tree, Gren park; private apartments, hostels, etc. as per the visitor's convenience. Thus, the cost for a single dental care in western countries is equal to a specialized dental care clubbed with a grand trip in Chennai. Chintamani Laser Dental Clinic offers patients individual attention and comfortable stay along with world-class treatment. Communication facilities like telemedicine, internet, telephone is provided by our organization worldwide. Wide range of treatment is provided at our unit and the treatment includes Aesthetics, Dental Implants, Laser Dentistry, Temporomandibular Disorder and Routine Dentistry. Our doctor will be in touch of you and would make follow up's throughout the treatment. Local mobile transportation, treatment plan, cost of treatment will be helped with from our center. Your nearby ones can visit the hospital as the pick and down facilities are provided by our center. Hospital facilities will also be taken care of. Fast recovery can be achieved by the hospitality of the staff and ambience in the rooms. Patient satisfaction is also taken into consideration after the treatment phase. Treatment cost vary according to the patients condition and the risk which is required to treat. 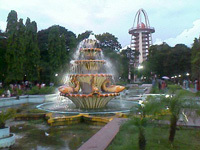 Situated at the Anna Nagar Park at Chennai, the Anna Nagar Tower is considered as the biggest and highest park tower. 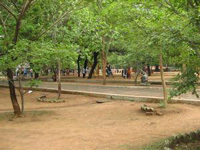 It is the smallest national park and one of the best picnic spot in India. The park encloses beautiful forests, lakes, streams along with a variety of species of mammals and birds. The Government Museum Complex is popularly known as the Madras Museum. It is the largest museum in South Asia. The museum has a rich collection of Roman antiquities, palm-leaf manuscripts, rare artistic works, etc. The Marina beach lying along the Bay of Bengal is the world's second longest beach. The beach is primarily sandy, which adds to its uniqueness. The beach is suggested to be a dream spot for 'Walkers'. 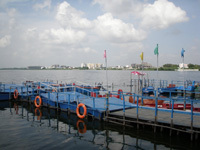 The Muttukadu Boat House in Chennai offers water skiing, wind surfacing, rowing, and speedboat riding to the visitors. An exciting experience is provided by the rocking bridge over the backwaters. This britist landmark was built in the loving memory of the British Administrator, Mr. Ribbon. The bank is located on 3.2 hectares land. 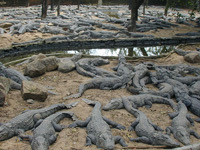 It provides one of the best research place to study Crocodiles. Although dental tourist travel to Chennai for a variety of reasons, but price consideration is one of the main aspect. Chennai chiefly offers lower price for dental reatments. Dental care, here, costs only one-tenth as in other western countries. Chennai houses speciality hospitals with professional doctors. The prices for all kinds of dental treatments are very low. However, the high quality standard is maintained. A single Dental Filling is charged in the range of $300 to $400 in USA & Europe whereas the same procedure costs only $20 to $40 in Chennai. The city focuses to help people coming from overseas to get good quality treatments at affordable prices. Chinthamani Laser Dental Clinic and Implant Centre is a unique example of such dental service and care. We are well-equipped with latest modern techniques to provide our part of service for a healthy dental care. We assure to our clients a high quality dental care with a memorable trip at a reasonable and affordable cost.